Back before LOLcats were everywhere you turned, the folks at Scientific American published information on photographing cats in their December, 1931 issue. Learn what early photographers did for good LOLcat images in the days before the GIMP and Photoshop. CATS are easy to photograph-if you can tap an unlimited supply of patience. Beyond that, all you need is a camera (I prefer a reflex) with flash attachment. An assistant, portrait lenses, a tripod and a flash extension are helpful, but by no means essential. The best place to work is a spot the cat likes best and the best time is just after he has eaten. When the cat gets down to the business of washing, you can start clicking. Set up your equipment beforehand and keep backgrounds plain. If the cat happens to like a spot in front of a cluttered background, stretch a sheet behind him. Isn’t that picture just screaming for a LOLcat caption? I’m imagining something like “Plz 2 find t3h water is getting m3h”, but I’m a bad LOLcatographer. 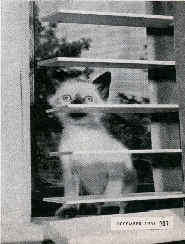 I don’t know how photographers in 1931 got their captions on images, but these seems to be the earliest sign of the coming LOLcat meme.